Navigation can be found here: http://gis.mctx.org/apps/parklocator/ Click on the magnifying glass at the top and type in Ed Rinehart Park and hit enter, then hit the Locate button and it will guide you. located at 15709 Park Road , Splendora, Texas, 77372, is a 32 acre facility consisting of five lighted baseball fields, five softball fields with two concession stands and restrooms. The park also includes one 300 foot adult field with concession stand and restrooms. The baseball program is offered through Splendora Youth Baseball (SYBA) and softball through Splendora Area Softball Association (SASA). Navigation can be found here:http://gis.mctx.org/apps/parklocator/ Click on the magnifying glass at the top and type in Ipes Park and hit enter, then hit the Locate button and it will guide you. Sallas Sports Complex, located at 21675 McClesky, New Caney, Texas, 77357, is a 20 acre facility with five lighted baseball fields and three lighted softball fields with concessions and restrooms. Click here for more information and more pictures!! Navigation can be found here: http://gis.mctx.org/apps/parklocator/ Click on the magnifying glass at the top and type in Sallas Sports Complex and hit enter, then hit the Locate button and it will guide you. 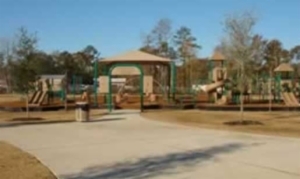 Tram Road Park, located at 15901 Tram Road, Splendora Texas, is a ten acre facility consisting of two football fields, playground with picnic area, concession stand and restrooms. For information concerning the football program contact Splendora Youth Football Association by email at splendorayouthfootball@yahoo.com . Or visit their website www.syflwildcats.net. Navigation can be found here:http://gis.mctx.org/apps/parklocator/ Click on the magnifying glass at the top and type in Tram Road Football Park and hit enter, then hit the Locate button and it will guide you. Tamina Park is a four acre parcel of land located approximately one half mile east of Interstate 45 in South Montgomery County on Main Street. The site contains a small community building, a softball field and covered basketball court with four goals, picnic tables and benches, playground equipment, barbeque grills, and bike racks. For information about Tamina Park or to reserve the community building call Commissioner Precinct 4 office at 936-521-8919. Navigation can be found here: http://gis.mctx.org/apps/parklocator/ Click on the magnifying glass at the top and type in Tamina Park and hit enter, then hit the Locate button and it will guide you. Small park located behind Montgomery Creek Ranch off of Woodhollow Dr.